OpenMBEE is an open source community built around a Model-Based Engineering Environment. The concept is to create an integrated environment for engineering that is driven around models and capabilities which support model-based approaches. Such environments inherently serve multiple modeling languages as well as a variety of techniques for model checking, simulation, document generation etc. OpenMBEE GitHub has a variety of open source projects supporting this pursuit as well as contributed open source models. The intent is that more open source models and model libraries will flourish as the community grows. Another distinctive quality is that the open source software on OpenMBEE includes plugins or extensions for commercial tools. This supports the idea to create a unified environment based on a variety of commodity software. Software is typically licensed under Apache 2. So it is free to use without strings. OpenMBEE has several major organizations on the leadership team. Anyone is welcome to join. There are regular meetings on line and face to face. We hold regular face to face meetings at the OMG and we meet regularly online. OpenMBEE software provides a platform for modeling that utilizes the Model Management System (MMS) that can be accessed from rich SysML desktop clients like MagicDraw, light-weight web-based client like View Editor, mathematical computation programs like Mathematica, and any other tool that can utilize RESTful web services. It provides infrastructure for versioning, workflow management, and access control. OpenMBEE software facilitates multi-tool and multi-repository integration across engineering, computing, and management disciplines. OpenMBEE software provides the core allowing tracking relations between heterogeneous data sources in a linked data architecture. System models are constructed, queried and rendered following the view and viewpoint paradigm. MDK is a plugin for MagicDraw that's primary purposes are to sync SysML models with the MMS and implement the DocGen language, which allows modelers to dynamically generate documents in a model-based approach using the view and viewpoint concept. MMS is a version control system for structured data. It exposes model information through RESTful web services that can be used for CRUD operations, branching, and tagging of the model repository. VE is designed to enable users to interact with SysML models within a web-based environment. It implements the MMS REST API to provide a web environment to create, read, and update model elements, including Documents and Views. TMT is currently being developed by the TMT Observatory Corporation. The TMT SysML model provides an industrial scale application of OpenMBEE and system-level behavior simulation. The main objective for the TMT related analysis is to provide state-dependent power roll-ups for different operational scenarios and demonstrate that requirements are satisfied by the design as well as mass roll-ups and duration analysis of the operational use cases. 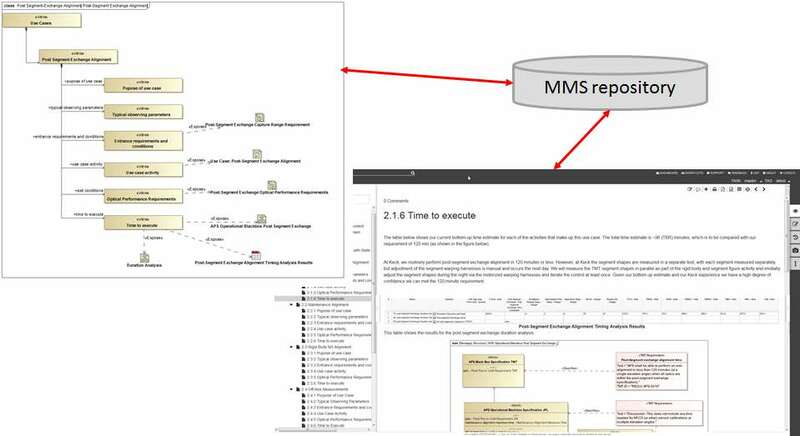 The model is built with an approach to model-based systems analysis with SysML that is both rigorous and automated. The approach’s rigor is established with a modeling method that is an extension of INCOSE’s Object Oriented Systems Engineering Method (OOSEM). Other projects, such as tool-specific Model Development Kits for Mathematica, MATLAB, ModelCenter, and a AsciiMathML based expression editor can be found in the organization's GitHub page.